I had the opportunity to ask Colby a few questions about his schoolboy career and his expectations for this weekends Ohio State Championships and next weekends Jim Ryun High School Dream Mile. Colby has the tools of a great miler, good 400 speed, great acceleration, distance running endurance, excellent focus and a great, positive mind-set. He thrives on pressure and enjoys competing. His expectations are high and, as he says, he “love(s) racing and getting challenged by other runners.” In the next two weekends, he will have his challenges and the opportunity to use all of his tools when challenged. in a race. He has the skill and the mind-set to win both of these races and to perhaps break Bob Kennedy’s 1988 State Record run of 4:05.13 proving that he just may be the best High School miler in the nation." OHRunners: Colby. When did you start running? How old were you? What did you run? Colby: I started running CYO cross-country and track in 6th grade. I ran everything from the 100 to the mile in track and even high jumped. The distance in cross-country was between 1 and 2 miles depending on the division I ran. OHRunners: At about what time in your career did you start to realize that you had some ability? When did it all start to "click" for you? What were your first goals? Colby: I ran a few age group road races as a kid and would win most of the time. They were usually only about a mile long. It started to click pretty much right away but this year when I qualified for Footlocker was when I really realized I could compete on the National level. When I first started, my goals were always to win the race and as time went on they became more specific. OHRunners: When did you decide you wanted to run the 1,600/mile? Can you describe your first 1,600/mile? What was your time? Colby: Right away the mile was my favorite event. The first mile I ever ran seriously was a race my mom used to put on for the elementary kids in Strongsville. It was a 1 mile cross country race called the Mustang Stampede. I can't remember my time but I know it was over 6:00. OHRunners: How influential and supportive have your parents been? Colby: They don't really know anything about running, but they do like the rodeo! Just kidding! My parents have been really supportive. My mom has been my coach since 7th grade. I think she is the best coach there is. They've both attended every race I've run since I started running in CYO! Colby: There are a number of people who have influenced me in my running career. My older brother Andy, was and still is a big influence. He was a great high school and collegiate runner. When I was little, my dad would always tell me running stories. I remember stories about how great the Kenyan runners were and how hard it was for the Americans to run with the Kenyans and I would always tell my dad I was going to be the first American to beat the Kenyans! He would also tell me stories about the great Oregon runners and Steve Prefontaine. Since then, I've watched all of the Pre movies and footage of his races. OHRunners: Let's look at little at your training. What is a typical week during the competition season? What will your workouts be this week? How are you preparing for this weekend? I understand pace and race strategies and no matter how one prepares physically and mentally, the actual pace and circumstances of a race can play an important influence on the outcome of a race. Do you visualize your races? Colby: Monday-Track work. Each week we work on a different segment of my race. Tuesday- 40-50 minute run. Wednesday- Dual meet. I do a workout or run after the meet depending on what I run in the meet. Thursday- 40 minute run. Friday- Pre-meet. Saturday- race! Sunday- day off. Wednesday following the meet, we try to do thousands or a threshold to keep the strength I obtained in the winter. This week I will just sharpen up. Not much lactic acid work, if any. When on the track, it will be faster than race pace, but I don't cut down much on mileage because I don't run too many miles as it is. I do visualize all of my races. I try to think of many different situations and how I would react to them. Visualization has really helped. Its’ helped me to learn to relax in pressure situations. OHRunners: What do you like about training the most? The least? Colby: I love the confidence I get from doing a good track workout. I don't like going on road runs nearly as much as track workouts, but I know I have to do them to stay in good shape. This is where it really helps to have teammates to make the time go faster on the runs. OHRunners: What do you like about competition the most? The least? Colby: I love racing and getting challenged by other runners. I love track because I have all the tools to be a successful miler. The thing I like most about competition is being able to use these tools when challenged in a race. I hate losing. OHRunners: What are those tools? Colby: The tools needed to be a great miler are; good 400 speed, ability to accelerate on a dime, whether that's to hold off a challenge or pass somebody with authority. You need the endurance of a distance runner and the speed endurance of a half miler. You also need the mind-set and ability to push yourself in the middle of the race without worrying about the finish. And maybe the most important thing is, you have to really enjoy competing against the best. Which means you have to be good under pressure. When the pressure is at its highest, I then try to relax the most. You also have to stay positive at all times and you can't worry about things like, other runners or the weather. You should only focus on what you can control. I'm not saying I'm the only one with these tools but I think I do have them all. It appears that with your decision to concentrate on the 1,600 at State that realistically, the only goal of the above that is attainable in our Ohio HS season may be the ones for the 1,600. Your 4:09.53 was the nations leading indoor time and your 4:11.99 is currently the leading time in the State for the 1,600. Colby: As for my goal of sub-4:05, I still have a few chances, including the Jim Ryun Dream Mile. It's hard to run 4:04 alone. In NYC I won't be setting the pace and that makes a fast time easier. I may go 800 at Junior Nationals. I split 1:52 at Regionals running even splits. If I go out faster, I'm know I can go under 1:50. I've run 49.7 for the 400 this year so that tells me I can break 1:50. I might run the 3200 at NBN. I've only run it once this year and ran 9:09 but I want to break our school record of 8:56. That’s a new goal I've made since my last interview with Aaron Rich. Our school record of 4:10 is really fast but my workouts are going great and they point to a fast mile. I ran 4:09 indoors and am in much better shape now. Colby: Josh Sabo is a great competitor. I really respect him. He comes from a great program that turns out fast distance guys every year. If he decides to run the 1600, I'll be ready. If he decides to run 800 fresh, he can win it, without a doubt. 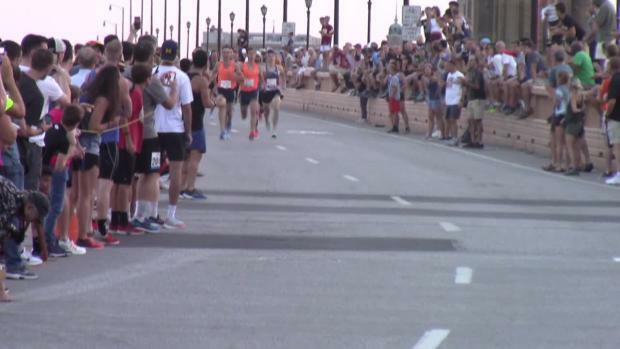 OHRunners: Are you confident and comfortable with your pace to take a run at Bob Kennedy's 4:05.17 State Record setting the pace and perhaps just pushing yourself? 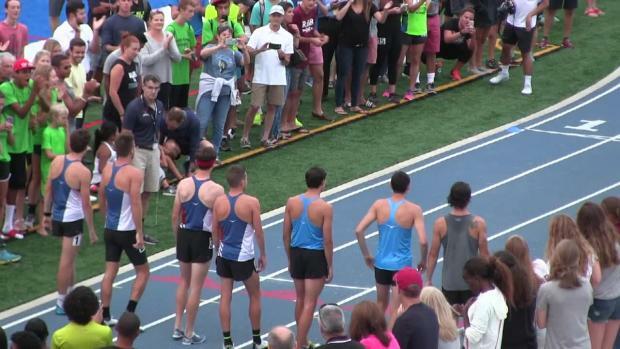 What are your expectations in the State 1,600m finals? Colby: My goal since I was in elementary school has been to win the 1600 State title and to do that in Ohio you're going to need to beat some fast milers and I'm ready for the challenge. My main goal is to win this weekend. You can't take anything for granted. If I get Kennedy's record, that would be a bonus! I am definitely going for it at the Dream Mile though. OHRunners: I know that your concentration is on this weekend, but I have to ask about your expectations for the Jim Ryun High School Dream Mile the week after State. Colby: The Dream Mile is an opportunity that hasn't ever been given to high school runners. I am really pumped to run against 11 of the top milers in America. This race is pretty much the National championship mile because you won't get all of these guys in the same race anywhere else.